Dorset has some of the best beaches and bathing waters in the country. However, there is a big issue with litter on these beaches, much of which comes from people dropping or leaving litter in these special places. We are working with Dorset Food & Drink and The Arts Development Company through the Dorset Coastal Connection Project to offer local businesses the opportunity to join us and help reduce the amount of litter found at Dorset’s beaches. Why are they an issue? A study by Unilever reveals that a third of consumers (33%) are now choosing to buy from brands they believe are doing social or environmental good. 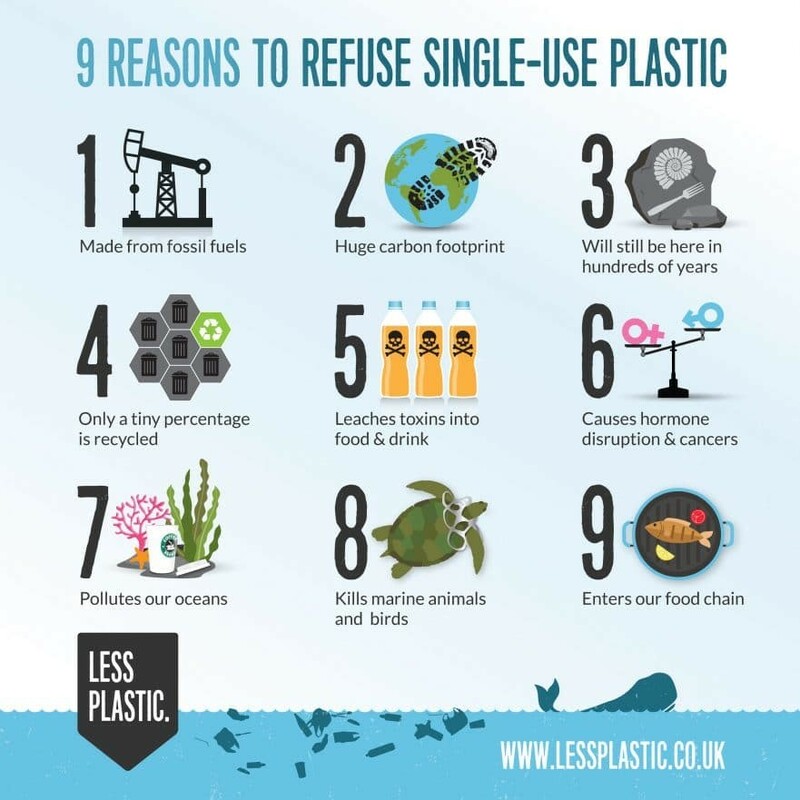 Help local businesses to move away from single-use plastic and change to more sustainable options that is cost effective for them and helps with the litter issue at the beaches. 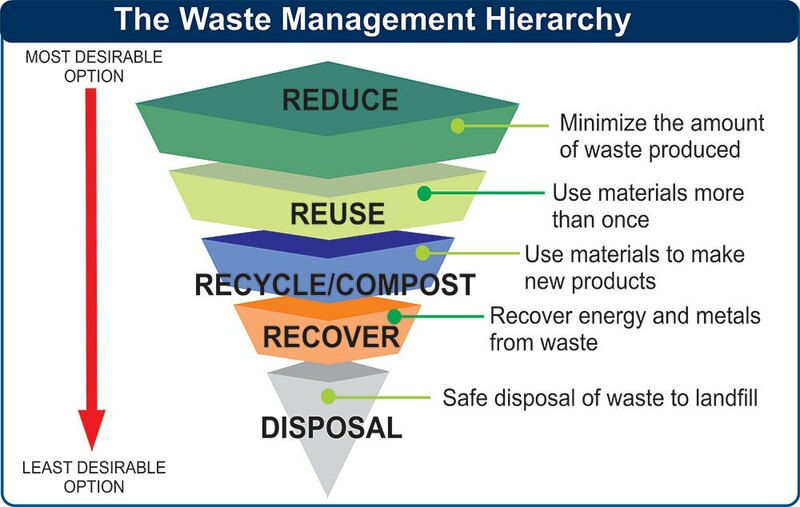 We use the Waste Hierarchy as our guide, with the best first approach to REDUCE any excess or unnecessary packaging, followed by the REUSE of containers by encouraging customers to bring their own and/or provide reusable options. The last option is to resort to using single-use packaging that can be RECYCLED/COMPOSTED. We ran 3 Plastic Surgery events at West Bay, Bournemouth and Weymouth in February 2018, where local food outlets and kiosks were provided with information and support to switch to changing changing their food and drink packaging. They also had the opportunity to meet and talk to eco-friendly and sustainable packaging suppliers, along with listening to other local businesses who have already started their journey to reduce the amount of waste they produce. We would now like to share what we have learnt with you, so that you can make the change and reduce the amount of single-use plastic you use. We are not experts but we hope that with our research and information below you can make an informed decision on what you do next. Change from serving plastic straws to either removing them completely or by offering reusable straws. 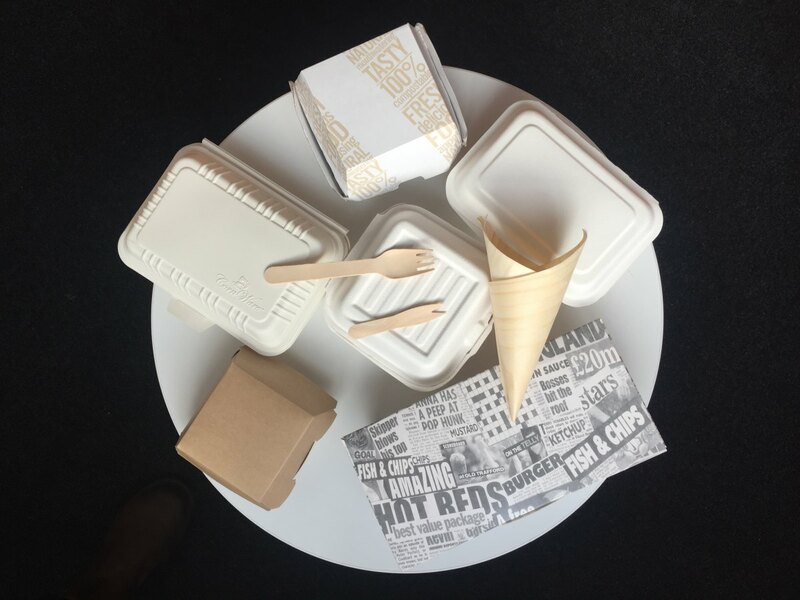 Takeaway food containers – switch from Styrofoam to Cardboard or encourage people to bring their own. Switch from plastic water bottles or offer customers free water by joining our Refill Scheme. perhaps sell reusable water bottles and make a profit by doing so. Offer discounts for people using reusable coffee cups (you could even sell these cups to allow new customers to choose this option). get rid of small plastic sauce sachets and replace with refillable condiment dispensers. Use wooden/bamboo cutlery instead of plastic. To get you thinking about the different types of packaging and which one may be best for your business, we have rounded up what we believe to be the main types on offer at this moment in time. Reusable packaging is packaging that is used more than one time. Reusable or returnable packaging is designed for repeated reuse. Economic benefits can include direct savings in packaging purchase and disposal cast as a result of repeat reuse. It is more sustainable as less packaging waste is being produced/discarded. Reusable packaging can be designed to suit your needs. There is potential to use your reusable products as a marketing channel, as it offers opportunities to include your brand on packaging. Reusable packaging is more expensive than other alternatives. Not all customers want to pay extra for reusable items. There is not as much choice compared to expendable packaging, due to lack of suppliers and cost. 1. What is it made of? Most plastic alternatives that are made from 100% renewable biomass source such as corn starch. However, some are made of a mixture between oil derived plastic and renewable materials – these do degrade more quickly than oil derived plastic but still obviously have plastic in them. 2. How does it degrade? There is a big difference between degradable, biodegradable and compostable. Degradable – Everything is degradable so this isn’t necessarily a positive environmental claim. For example oil derived plastic is photodegradable – meaning it breaks down in sun light – however, plastics is damaging to the environment because it never breaks down completely and remains as micro plastics – it can be recycled though. Biodegradable – This mean an object can be biologically broken down by microorganisms. Compostable – When a product biodegrades to produce carbon dioxide, water and humus within a specified period of time. Made from plant materials which are renewable unlike oil which is from a limited and finite resource. Non-toxic and won’t leach chemicals into food. If being disposed of through incineration then are better for environment as made from plant based materials means they are non-toxic so do not emit harmful chemicals when burnt. Not recyclable – designed to be composted therefore cannot be recycled again and again and again. Are not necessarily better for the marine environment if they are littered – they are designed to be composted not to break down in the marine environment therefore may not be any better than plastics in the marine environment if littered. Some of the plant material used for compostables comes from GM sources – some see this as a negative and others don’t. Compostables could potentially encourage people to litter more as they assume they will biodegrade in the natural environment. The infrastructure needed to get used compostable packaging to industrial composting facilities for processing is not in place in Dorset yet. Therefore it might be difficult to get your used packaging composted. Recycling contamination risk – if alternative plastics get into the plastics recycling system then they can cause issues. They can reduce the quality of the recycled plastic and mean that they cannot be recycled anymore. Cardboard, paper and wooden packaging are made from renewable materials. Cardboard, paper and wooden packaging are recyclable. Cardboard and wooden packaging can be reused. Cardboard, paper and wooden packaging is relatively cheap to buy. Cardboard and paper products are not water resistant. If contaminated with food and drink these products are difficult to recycle. Some cardboard packaging products have plastic lining (watch out for this). Depending on what the packaging is being used for, some items still have a single use lifespan. Plastic continues to be the most affordable packaging material, making it very cost effective. Plastic is durable, meaning it can last for a long time. Plastic is light in weight and easy to handle. Plastic is waterproof, tear proof and shatterproof. This makes it easy to manage, transport and store. Some plastic packaging can be recycled. Would need to check with your chosen waste collection company to find out which ones they can collect. Disposable plastics used in packaging foodstuff contain harmful compounds. Improper disposal of these packaging products leads to these harmful compounds finding their way to water bodies, where they dissolve over a long time due to their non-biodegradable nature. Plastics that end up as litter can be harmful to animals. Plastics are non-biodegradable often taking hundreds of years to decay. This is due to the intermolecular bonds that constitute plastics, whose structure ensures that the plastics neither corrode nor decompose. Plastic litter can clog waterways causing pollution and making it costly to get rid of them. Plastics generally have a low melting point, meaning some plastic products are highly flammable. Plastic packaging that is contaminated with food and drink may not be able to be recycled. As part of this work we will be commissioning an artist for 2019 that will celebrate local businesses that have reduced their amount of plastic and considered their packaging in regards to using environmentally friendly and sustainable packaging/products and encourage the public to support these businesses. We currently do not know who the artist will be or what amazing piece of art will be created yet but we will keep you up to date as things progress. This project is part of Dorset Coastal Connections portfolio of 18 projects across Dorset’s Coast which aim to improve physical, digital and emotional connections between people (both residents and visitors) and the spectacular Dorset Coast. These projects all benefit from funding from the Coastal Community Fund, a grant from central government to improve coastal areas and are coordinated by Dorset Coast Forum. For more information about the Dorset Coastal Connections projects portfolio, click here. If you are a local business who would like to find out more or would like to keep up to date with our Plastic Surgery campaign, please join our Facebook Community Group or get in touch via our Contact Page.